2016 Jay Hoxie Award nominees: Leticia Abrego, central region; Brent McCloud, north region; Brittany Alanis, east region; and Cesia Alvarado, central child welfare services. Monica Bonilla, south region, was not present. Social workers have their plates full. But beyond a job that’s not prone to normal office hours, many of them put in extra hours giving back to the communities they serve by volunteering. Brent McCloud is one of those social workers. McCloud was the winner of the 26th annual Jay Hoxie award at the HHSA Child Welfare Services’ social worker appreciation event. The award is given to recognize a social worker for commitment to others through volunteering in the community. It’s named after Jay Hoxie, an HHSA social worker who died in a car accident in 1990. He was well known for his generous spirit and community involvement. McCloud is an emergency response worker in North County. He works with at-risk youth, the homeless population and orphans in Mexico. He volunteers as a coach with the Escondido Police Athletic League, as a compliance monitor with the juvenile diversion program, with the Dream Center that works with homeless population and Camp Connect among other organizations. “Brent wants to make a difference in the lives of children,” said HHSA North Region General Manager Chuck Matthews. “Everybody wants Brent at the table to help make a difference in lives in our community. Joyce Castaneda and Michael Foltz were also recognized from the CWS foster care eligibility. County Chief Administrative Officer Helen Robbins-Meyer, Michael Foltz, Child Welfare Service Deputy Director Cathi Palatella, Joyce Castaneda and HHSA Director Nick Macchione. 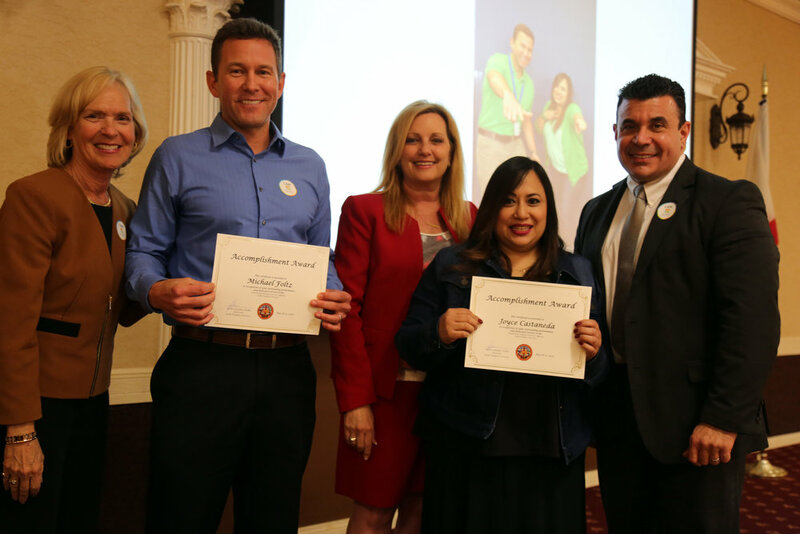 Foltz and Castaneda were recognized for their work in foster care eligibility.